BMW 4 Series Coupe Performance, Engine, Ride, Handling | What Car? The 4 Series uses a variety of engines from the 3 Series. These stretch from the entry-level four-cylinder diesel, the 420d, right up to the potent turbocharged six-cylinder petrol in the 440i and M4. The 420d has the broadest appeal. It's relatively swift and revs keenly for a diesel, with good flexibility when you need a quick surge of power to overtake. If you want a higher-performance diesel, the 4 Series presents two highly capable candidates in the 430d and 435d, the latter being available only with four-wheel drive. The only engine in the range to avoid is the 420i petrol, which revs quickly enough but simply can’t match the in-gear response of the diesels; it has to be worked hard to make reasonable progress. The turbocharged 3.0-litre petrol in the 440i, meanwhile, pulls strongly from very low revs all the way through to 7000rpm; it feels extremely quick and makes overtaking effortless, and is definitely the pick of the petrols. The pinnacle of the range is the high-performance M4. This has a twin-turbocharged straight-six engine with more than 400bhp, can go from 0-62mph in close to four seconds and has a huge number of bespoke parts to save weight and improve its handling. Like most BMWs, the 4 Series comes with the option of adaptive M Sport suspension, which can be adjusted to suit different roads and driving conditions. Cars fitted with these dampers strike a fine balance between ride comfort and agility. You can choose between Sport mode (for a stiffer ride but better road holding), Comfort and Comfort+, which softens everything for a more compliant but still well-controlled ride. On standard passive dampers, the 4 Series is a little less able to react to changes in the road surface, so lumps and potholes are felt as heavier thumps inside the car. It's therefore best to stick with smaller alloy wheels if you have the standard suspension. Even on adaptive dampers, the optional 19in wheels still send a few thuds through your seat when travelling over rough roads. 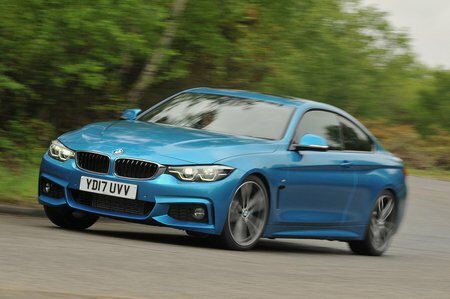 The exotic M4, with its standard 19in wheels and bespoke tyres, has a much firmer ride than any other car in the range, but its high-quality damping means it’s never uncomfortable. Of all the executive saloons, the 3 Series is one of the very best to drive. And its two-door cousin here is even better, feeling more composed than the 3 Series in corners, thanks to its lower centre of gravity and wider stance. The steering is accurate and responsive, making the 4 Series easy to place on the road. It offers more feedback than, say, the Audi TT's, while the car's rear-wheel drive layout gives it a real feeling of delicacy in corners. Probably the best part of the handling, though, is that this agility does not come at the expense of comfort. The 4 Series doesn’t float or bounce over bumps, treading a fine line between comfort and control. 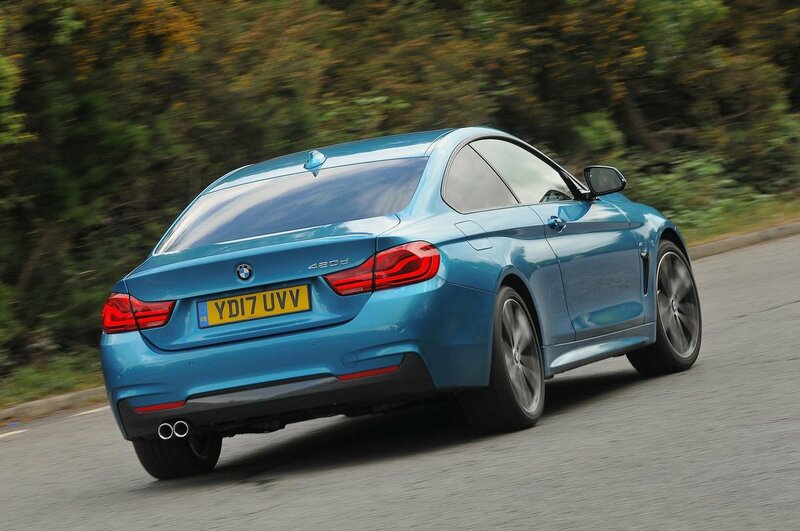 There is one caveat, though; the 4 Series is a bit wider than some coupés, so it can feel a bit ungainly on narrow roads. The six-cylinder petrol engine in the 440i is a peach, making a bassy thrum that becomes a creamy howl when you rev it. By contrast, the 2.0-litre diesel in the 420d sounds gruff – a trait that you can’t fail to notice on start-up or when accelerating. The six-cylinder diesels are a little more refined, but they still lag behind the most hushed cars in this class, such as the Audi A5 3.0 TDI. The 4 Series suffers from a little too much wind and road noise at speed. This problem is also quite dependent on wheel and tyre choice; the bigger you go, the louder the road noise gets. The standard six-speed manual gearbox has a springy yet accurate gait, but its clutch is quite heavy and there's often judder through the gearlever when pulling away. That’s why the optional eight-speed automatic gearbox is well worth considering, because it shifts swiftly and smartly and is more efficient and refined.